10 gallon (38L) aquarium kits such as this one are cheap and easy to fit into any room, which makes them a very popular choice. However, it can be difficult to figure out what fish to stock a 10 gal with. 10 gallons is not a lot of room and most fish in your local aquarium store will quickly outgrow a tank this size. Do not despair, though: there are definitely still plenty of options. Keep reading to find out which fish and inverts will work in a 10 gallon and which are better avoided! Many sites recommend fish species that actually grow too large or are too active for 10 gallon aquarium setups. The fish listed below are often labeled as suitable for a 10 gal but are actually best avoided or, at best, not ideal. Fancy goldfish – grow much too large and need a minimum of 20 gallons (75L) per fish. Caresheet here. Common goldfish – only suitable for ponds. Caresheet here. Danio – too active and large. Caresheet here. As you can see, most common small schooling fish are a no-go despite their size. They are simply too active and need to be kept in larger groups than can be housed in a tank of this size. Obviously, all species that can be kept in a 5 gallon (19L) aquarium can also be kept in a 10 gallon. This already gives us a few options, but be sure to keep reading for a more extensive list of species that could work well. If you’re missing a fish or invert on the list, feel free to leave a comment at the bottom of this article. When stocking your 10 gallon, try to stick to one fish species (two is definitely the maximum). Inverts have a low bioload and can usually be added to any setup. Mosquito rasbora (Boraras brigittae) – Very tiny, keep at least 7-8. Least killifish (Heterandria formosa) – Small livebearer, keep in harem or larger group. Pygmy Corydoras (Corydoras habrosus & hastatus) – Smallest Corydoras types, keep at least 6. Caresheet here. Otocinclus – Great algae eater but very sensitive. Keep at least 4, only for fully cycled setups. Caresheet here. Hara jerdoni – Not very common in the hobby. Supposed to do well in small groups. Betta (Betta splendens) – Great option for a 10 gallon. Very small and decorative fish. Caresheet here. Sparkling gourami (Trichopsis pumila) – Can be kept in pairs. Also known as croaking gourami! Dwarf puffer (Carinotetraodon travancoricus) – Needs specific care. Very entertaining fish. Caresheet here. Scarlet badis (Dario dario) – Small but feisty and colorful! Can be kept as pair or harem. 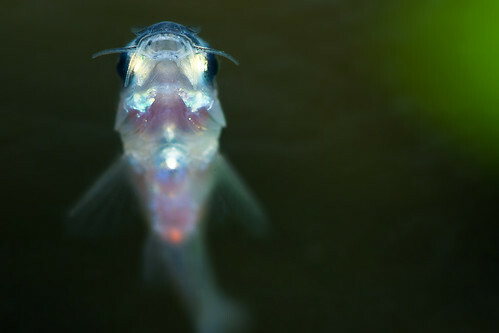 Peacock goby (Tateurndina ocellicauda) – Quite unusual. Keep in small groups. Clown killifish (Pseudepiplatys annulatus) – Colorful and interesting. Keep in groups. Various shrimp species – Neocaridina (including the popular cherry shrimp), Amano shrimp (Caridina multidentata), ghost shrimp (Paleomonetes sp. ), Sulawesi shrimp, rili shrimp, etc. Dwarf crayfish (Cambarellus genus) – Very amusing and not difficult to keep. Various snail species – Nerite snail, Assassin snail (Clea helena), black devil snail (Faunus ater), etc. There is still much discussion over the best way to stock nano tanks like a 10 gallon. The best way to figure out a stock is to keep in mind that the needs of your fish are always more important than your wants. Understocking is much better than overstocking and a tank with only one or two species does not have to be boring at all. Some may find the list above too conservative but it was compiled with the well-being of the fish in mind. If you have any additional suggestions or want to share your experiences with any of the species on the list, don’t hesitate to leave a comment below. I wondering if maybe I could put more than one of the species listed above in the aquarium and which ones. Thank you! Oh nvm didn’t realize that several people had asked that already, my bad us I do have one more question. I was wondering if maybe in a 10 gallon I could keep some clown killifish and some sparkling gourami and how many of each. Thank you! How many shrimp or crayfish do you think i can have if i put one type of schooling fish in the tank? Could you recommend a nice centerpiece fish for a ten gallon? I’ve had schools before but I’d like to branch out a bit more and have a bit of a closer relationship with my fish. If you want to establish a bit of a “relationship” with your fish then I’m voting for a dwarf puffer! I’ve got a full caresheet here, they’re fantastic little fish. 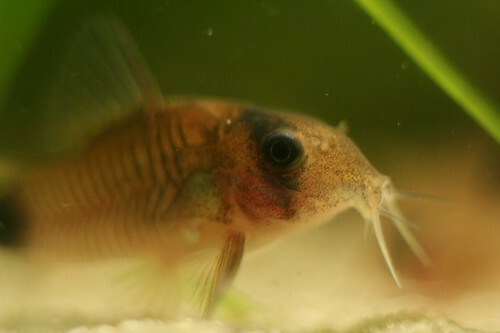 Would pygmy corydoras be okay in a tank with lots of driftwood and rock, and the eco-complete substrate from the “Choosing an Aquarium Substrate” article? What could I feed a stone catfish? This is my first tank. Hi! I’m not a huge fan of eco-complete for Corydoras as they do seem to prefer sand – maybe you can cap the substrate with a layer of sand? It’s not a huge disaster if you don’t since eco-complete isn’t sharp, but sand will allow you to see their natural foraging behavior. Asian stone catfish (Hara jerdoni) need a high-protein diet as far as I know. So frozen foods would work well but live would be fantastic! Thanks! I had wanted to start off with only plants first to see how things went, but I’m confused. Is this filter okay with a planted tank? Will I need to add CO2, or will the waterfall add gases to the water? I had wanted to start without fish, only plants, then add animals later. It’s a 10 gallon, by the way. Thanks for your help. Your website has been really helpful! Never mind the CO2 question, I just read the article on low-tech aquariums, and have bought fertilizers. Hi! Glad to hear you managed to figure it out 🙂 As you have probably concluded, yes, the filter you linked to is fine for a planted tank (and any other type of tank, for that matter). It won’t add Co2 to the water like a Co2 system does but you only need Co2 if you’re going a particular route with your planted tank and I wouldn’t recommend it until you’ve gained a little more experience. Fertilizers, as described in the low-tech aquarium article, should work just fine! In fact, for some plants even those aren’t necessary. In case you need it, here’s an article that contains some easy plants: 8 easy aquarium plants. With your current plan I’m sure everything will turn out just fine, good luck setting everything up! What is your opinion on male 4 – 6 Endler’s for a 10g? Doable? Would I be able to add inverts to the mix? Thanks for pulling this article together — saved me from dooming some tetras! Hi! Glad to hear the article was helpful. As for Endler’s, I generally don’t recommend any guppies for a 10 gallon. I’ve listed Endler’s guppies as suitable for 15+ gallons elsewhere on the site if I’m not mistaken. But don’t despair! I’ve got some good other options on the list. If you’re looking for something similarly colorful that can be kept with inverts such as dwarf crays and shrimp, mosquito rasbora might be an option. I also think scarlet badis might be fun if you’re looking for a fish with plenty of personality, though these do have an appetite for the occasional shrimp fry. I hope that helps, good luck stocking your tank! If I wanted to add multiple species to my 10 gallon tank, what would you suggest? I’m just looking for a group of pretty fish. If not, I may just put a single male betta in there. The options are very limited, but you could get a few Hara jerdoni or Otocinclus (if you’re an experienced fishkeeper) catfish and a harem of least killifish or sparkling gourami. If it doesn’t HAVE to be fish, you can also combine a lot of the species on the list (not Bettas or dwarf puffers though) with dwarf crayfish. Those have a ton of personality and are super fun to keep. I would personally go this route. If I had a dwarf puffer, what other species could be kept in the tank? In a 10 gal I would just stick to maybe some shrimp with a dwarf puffer. In larger tanks there are a few more options although it’s still pretty limited. Is there any combination you could suggest for a 10 gallon community tank that includes a betta splendens? Thank you! Very well done! Might I add true endlers? What combination of these fish would you suggest for a 10 gallon community tank or is 10 gallons too small for anything other than a species tank?